Walnut, wood grain laminated top. The Deluxe Non-Tilt Overbed Table is locked securely when height adjustment handle is released. Silver Vein Base and Mast("H") base provides security and stability. 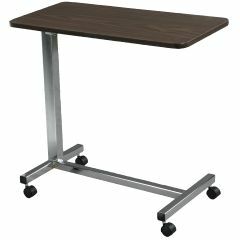 Adjustable between 28" - 45"
Height: Adjustable 28" - 45"
Sturdy. High Quality. Safe. Lightweight. Convenient. Good Value. Durable. I am using the over the bed table as a laptop table. It is more sturdy and well made than laptop tables I have looked at. I love working in bed and at my easy chair. It adjusts to either. I bought this for my wife after surgery. It is very easy to move around, and it has locking wheels for added safety. Sturdy. High Quality. Safe. Easy Storage. Lightweight. Good Value. Convenient. Safe. The table top keeps rising at times when I move the table. Sometimes difficult to lower. Will medicare and or Medicaid pay for equipment listed on this website? Some things are covered under Medicare & Medicaid and others are not. The over bed tables are not covered by insurance. Medicare will only pay for durable medical equipment provided by CMS approved providers. A new system was rolled out beginning in 2010 and is still being launched in various counties. It may not be covered at all if it doesn't meet the definition: Medicare Part B (Medical Insurance) covers durable medical equipment (DME) that your doctor prescribes for use in your home. Only your doctor can prescribe medical equipment for you. DME meets these criteria: Durable (long-lasting) Used for a medical reason Not usually useful to someone who isn't sick or injured Used in your home Please call Medicare at 1-800-6333-4227 to obtain the details of your specific county and circumstances. The top of the table on this model does not tilt, it only adjusts the height up and down. Good product, very useful for my bed bound husband . What is the lowest height that this table goes and what is the space (width and length) of the area INSIDE bottom wheelchair structure to accommodate legs and chair? Thank you. (also what is manufacturer of this chair?) I am looking for a sturdy chair, which will go lower than 171/2" in height with the most leg room possible. This chair seems to have overall best reviews. Am not concerned about cost (within reason) need this for functioning with computer, cooking, planting generally helps in many activities. Would like the lowest rise possible, but the tables listed as low rise all sound flimsy. Would be happy for a recommendation. Thank you. The table is 15 inches by 24 inches. It raises up to over 5 feet and lowers to 3 feet. My mom is in a hospital bed & she really loves the table. It's easy to maneuver.